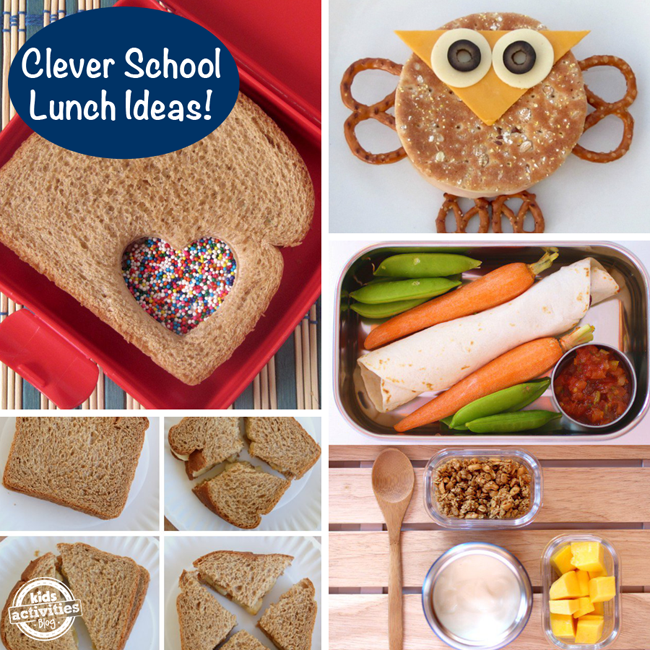 With school starting back, it can be hard to be creative with a kiddo’s lunch menu. This is a list of 20 packed lunches that will make the transition smoother. A Waffle Taco Bar is something you don’t see everyday! Include ground turkey, cheese and tomatoes and other favorite taco toppings. Yum. Jurassic Park fans will love this roaring fun Dinosaur Bento Lunch. Corn dog muffins with cheese wands and clementines give your kiddo a bit of comfort food and healthy food. Make a big batch of Chicken Parmesan Meatballs. Not only will the kids love them, but they make great lunches for moms and dads, too! Make sandwiches a little more interesting by turning them into wraps instead, like this Turkey Bacon Ranch Wrap. Nothing will make your kid happier than some 4 Cheese Pepperoni Pizza Bites paired with fresh fruits and veggies. Make some ham and cheese pinwheels in batches. They’re yummy for breakfast or lunch. Make baked ravioli for dinner, and then put some in kiddo’s lunchbox the next day. Two meals, just one prep! How much will your kids love Polka Dot Pizza Dippers? Make them with biscuit dough and pepperoni slices, and serve them with some marinara sauce on the side. PB&J gets a new twist on a tortilla with a banana in the middle — a PB&J & Banana Burrito! Comfort food in the lunchbox IS possible. Just make these chicken pot pie cupcakes and see for yourself. Pair cheddar with crunchy apples in Apple and Cheddar Quesadillas. Kids love them! Serve alongside fresh veggies and dip. Cream cheese and ham pinwheels are delicious and EASY. Great for party appetizers, too. Send a healthy taco salad in the lunchbox. Include some tortilla chips or corn chips on the side if those are a must for your kiddo. Peanut butter and apple waffle sandwiches are sure to be tasty. Check out her fruit-infused water idea, too! Nothing is more comforting than a hot lunch on a chilly day. Kids will love these grilled cheese roll-ups with a thermos full of tomato soup. Rolls are perfect for making sandwiches for little hands, like this turkey and cheese roll served with goldfish crackers, green pepper slices and fruit. Spaghetti pie muffins: You don’t need a specific recipe… just bake whatever you make into muffin tins and add some cheese on top. Yum! Put their favorite sandwich fixings on a skewer to make sandwich kabobs. Don’t forget the veggies! BLT pinwheels are a fun spin on a classic sandwich. Shout out to One Crazy House blog for these delicious lunches! For many more quick, easy, and inspiring lunch ideas, go to www.onecrazyhouse.com.